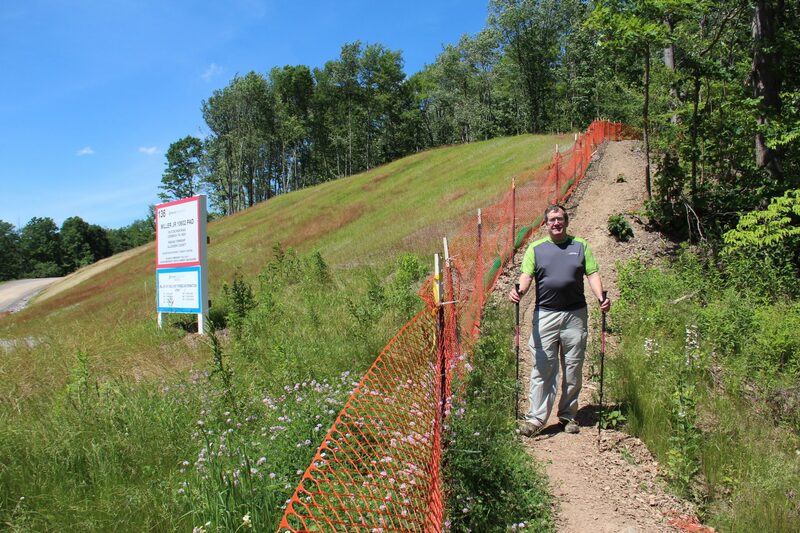 Bob Mulshine, president of the Rachel Carson Trails Conservancy, on a section of the trail that was moved to make way for a Range Resources gas well. The hike takes place along the Rachel Carson Trail, named after the Pittsburgher credited with starting the modern environmental movement. This year, Rachel Carson’s trail will have a new addition — the fracking industry. Range Resources is building a shale gas well along a ridge a few hundred feet from the route, in Indiana Township. Leading up to the well pad, a pipeline right-of-way, about 50 feet wide, has been cut through a wooded section of the trail. “Anybody who hikes the trail — they can’t help but noticing it,” says Bob Mulshine, president of the Rachel Carson Trails Conservancy. Kathleen Ganster with her son Kenton on the Rachel Carson trail near Pittsburgh. Mulshine said Range Resources contacted him to let him know they would have to re-route part of the trail to accommodate trucks and equipment heading up to its well pad. This year, Mulshine says, hundreds of hikers will see the drilling operations as they pass by. His main concern is that hikers don’t get lost when they cross this pipeline right-of-way. “For us, for a hiking group — this is not an inconvenience,” he said. Mulshine says this is the first time there’s been fracking along the Rachel Carson, but it’s hardly the only industrial activity on the route. The trail skirts busy suburban roads, power lines, pipeline rights-of-way, even a coal ash pile. He says the Marcellus shale industry is just another impediment to navigate around. Not everyone is happy about the drilling. Kenton Ganster has hiked the Rachel Carson Challenge with his parents. On a recent afternoon a few days before the Challenge, he was hiking a section of the trail with his mother, Kathleen, who’s done the Rachel Carson challenge four times and volunteers for the trail’s conservancy. Kenton Ganster said it was a shock to see a drilling rig so close to the trail. Even though he doesn’t like having the rig so close to the trail, he thinks it’s good for the urbanites who hike it to be able to see where their energy comes from. 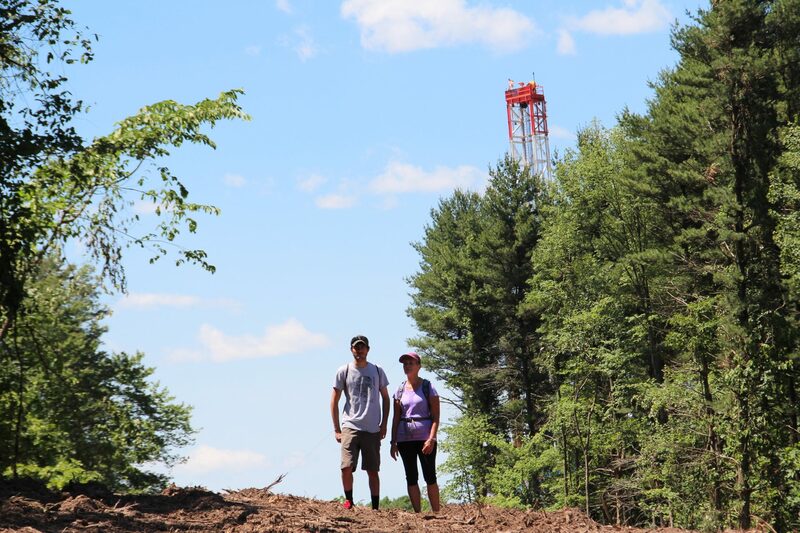 His mother, Kathleen Ganster, says the drilling rig won’t ruin her experience along the trail. Range Resources, which, according to Mulshine, is sponsoring the hike at the $1,000 level this year, didn’t respond to interview requests. Mulshine said he was happy with how the company has handled the situation. The pipeline route leading up to the rig has been cleared of trees and woody debris that would have made hiking over it arduous. “We were thrilled that a drilling company wasn’t trying to force us out of the woods,” he said. Mulshine doesn’t know what Rachel Carson — whose 1962 book “Silent Spring” helped launch the environmental movement — would think of fracking along a trail named after her. “I don’t think that she would expect everything to be perfect and everything to work out exactly how she would like it to work out,” Mulshine said.